Do you have secrets you need to hide from the prying eyes of the players? Are you tired of looking in the back of the book every time you need to check for aces, blunders, or the damage done by a submachine gun? do you want to make those important interrogation rolls secretly, where your players can't see them? 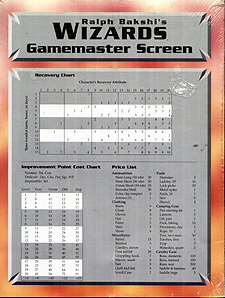 Then the Wizards Gamemaster Screen is for you! Covered front and back with all the charts you and your players need for quick and easy gaming, the Gamemaster Screen also provides a handy shield to protect your secret maps and die rolls from accidental viewing. All the charts you need are right in front of you, so no longer will you be bogged down by looking up references in the rule book. Plus, as a special bonus, you get a 32-page adventure, Desert Wind! This adventure takes the characters into The Desert in search of some dangerous technology that was uncoverd by the capricious sands and winds. Can the party destroy these evil artifacts before one of Blackwolf's liches gets hold of them? This is an accessory for the Ralph Bakshi's Wizards roleplaying game. It is not a complete game in itself. You must own Wizards to be able to use this product.